TNEA Counselling 2019: Tamil Nadu Engineering Admission is a screening procedure conducted by Anna University to facilitate admissions into B.E /B.Tech programmes of Tamil Nadu Colleges. TNEA Counselling will take place in the first week of May 2019. TNEA conducts no separate entrance examination for admissions and candidates are selected for one of the participating colleges based on the scores they obtain in their 12th class. In order to participate in the counselling procedure, candidates must register themselves in the TNEA registration portal or Anna University Official website at www.annauniv.edu. Anna University is also introducing facilitation centers to help candidates with the registration process all over Tamil Nadu state. Around 563 engineering and technology colleges participate every year in the TNEA Counselling procedure organized by Anna University and their admission procedure will include registration, document verification, and reporting at the specified destination. 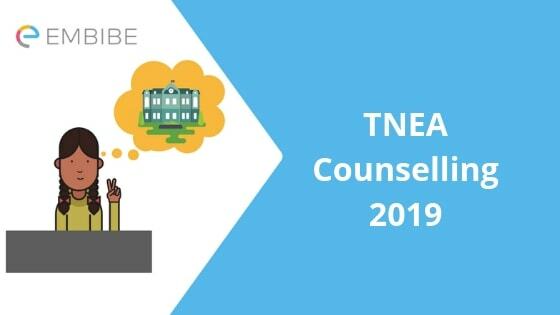 In this article, we have mentioned all the required information regarding TNEA Counselling 2019 including the detailed step by step procedure. Read on to find more. Unlike previous years, TNEA Counselling for 2019 will be conducted online and candidates who meet eligibility criteria can log in to the official website and fill in the application to start the registration process. As mentioned earlier, candidates must have passed 10+2 or equivalent with 50% aggregate marks in Physics, Chemistry, and mathematics whereas the candidates belonging to SC/SCA/ST are eligible with aggregate marks of 40%. Now let us look TNEA Counselling for 2019 in detail. 1. Filling in details: Candidates must register in the official website using their email id, mobile number. Candidates should enter details regarding their nativity, religion, and method of communication at this step. 2. Payment of the application fees: A certain amount of Rs 500 for general and Rs 250 for SC/ST/SCA must be paid during the registration process. This amount can be paid either online or offline through the demand draft. 3. Filling in personal details: Candidates must enter their information regarding their nationality, category, and scholarships here. 4. Filling of Academic information: As the name suggests candidates must enter details regarding educational qualifications such as class 10 and 12 marks and the name of the board they attended. 5. Submit Application form: Before submitting the application form, it is advised to cross-check all the details entered in the above steps and then click on the Submit button. Each candidate will be allotted a unique random 10-digit number after submitting the application form. This random number for TNEA Counselling will help break the deadlock between the candidates in case of a tie. ID Proof like Aadhar, election ID and Driving license. During this stage, candidates will be given a week’s time to reach the closest facilitation center for the document verification. Post verification of the documents, students will be handed out a booklet with information on the colleges, seats, and courses. Post registration and verification, Anna University will release a rank list or merit list of the students based on the marks acquired in Maths and science subjects. In case of a tiebreaker, the older and highest random numbered candidate will be given the first preference. Only the candidates that appear in the merit list prepared by the conducting authority will be considered for the final round of counselling and this round will be held at the respective facilitation centers in the order of the ranks. During this stage, one must pay Rs 5000 (1000 in case of SC/ST) towards college admission. After making the payment successfully, candidates must log in to their accounts using their credentials and lock their choices or their college preference. The admission authority will also release the first round of seat allotment in the colleges based on the merit list and choice filling by the candidates. Candidates must stay active on the official website by logging in regularly to check their seat allotment result. The choice of either accepting or surrendering will be available for the student. The final seat allotment result will be released after the completion of all the rounds in TNEA Counselling. Now that you are provided with all the necessary details regarding TNEA Counselling, you must concentrate on the preparation for your 12th exam at this moment since it decides your future whether you will secure a seat in the college or not. While preparing for any competitive exams, one must take as many mock tests as they can to analyze their performance. Also, students must make a realistic plan that will allow them to work on both practices and revisions of all the chapters evenly. You can also start practicing and learning your syllabus of Class 12th on Embibe for free and receive advanced analysis by earning Embiums. Embibe has around 60,000 questions on JEE Main practice questions from science and mathematics subjects of Class 12th. These questions are specifically designed to help the students reach their goal. You can also receive personalized guidance throughout the practice to improve your score from time to time. We wish this article on TNEA Counselling 2019 helps you during the admission procedure. If you have any doubts regarding this article, feel free to drop a comment below in the comment section and we will get back to you as soon as possible. Embibe wishes all the very best for your exam! !